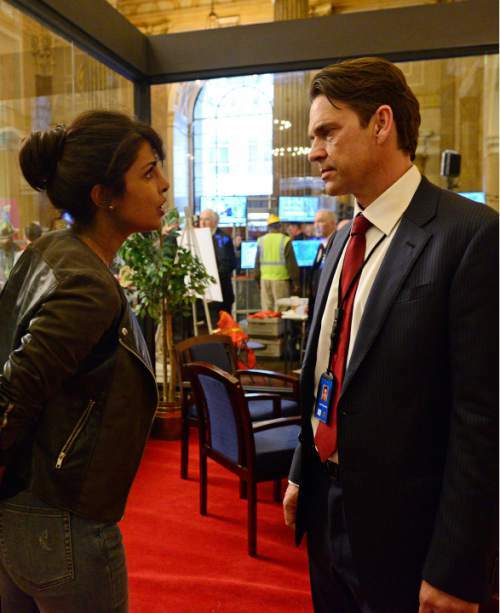 Priyanka Chopra and Dougray Scott star in the new ABC series "Quantico." Guy D'Alema | ABC Courtesy photo LDS Church photos of its temple garments, which faithful members wear beneath their clothes. There&apos;s a Mormon character in one of ABC&apos;s new fall series. And viewers will learn this when they see him wearing nothing but his temple garments. That&apos;s just one of the reasons that members of The Church of Jesus Christ of Latter-day Saints may not be particularly pleased with that character in the pilot of "Quantico," which is scheduled to premiere on Sunday, Sept. 27, at 9 p.m. on ABC/Ch. 4. The series is about a bunch of new recruits who arrive at the FBI training base in Quantico, Va., for training. They&apos;re assigned roommates, and recruit Caleb Haas (Graham Rogers) is surprised when he sees recruit Eric Packer (Brian J. Smith) changing his clothes and standing there in his temple garments. Faithful members of the LDS Church consider the garments sacred  not something to be a plotline on a network TV entertainment series. "You&apos;re wearing pajamas under your clothes?" Caleb says, before quickly figuring out that Eric is Mormon. "Are you Elder Eric? No way," says Caleb, rather stupidly stunned to think that  gasp!  a Mormon could be in the FBI. "Hey, do they know?" he asks. "Of course," Eric replies. "They recruited me." "Mormons respect authority, don&apos;t drink or take drugs, spend time in foreign countries, and they speak several languages," Eric says. "I&apos;m assuming none of that applies to you?" We learn that Eric served a mission in Malawi. We learn that Caleb is kind of an idiot, at one point referring to Eric as "Joseph Smith" and saying, "I want to see how many wives you have." Yes, indeed, it&apos;s the trite and over-used polygamy ploy. At the risk of a spoiler  so SPOILER ALERT right here  LDS Church members probably aren&apos;t going to be happy when they learn that Eric should have been excommunicated for what he did on his mission. For at least two things he did on his mission. And that&apos;s another old Mormon chestnut in Hollywood  the hypocrite who doesn&apos;t live up to his religion. The Mormon character plays an integral part in the "Quantico" pilot, but it&apos;s worth pointing out that the episode provided to critics is not the final version. We already know the episode will require some significant reshoots because one of the actors (Dougray Scott) has left the series and his part will be recast. But if the Mormon storyline airs in its present form, there will definitely be unhappy Mormons.